When your Okotoks roof has been damaged it’s important to get repairs right away. 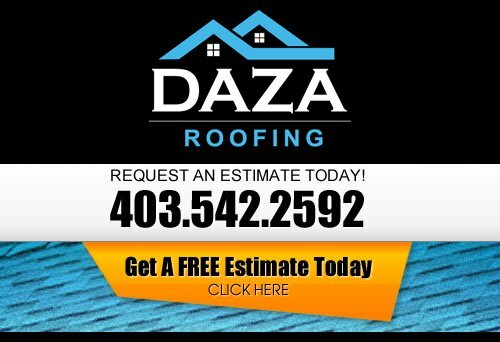 And when it comes to making the decision on whether you need roof repair or need a new roof altogether it is best to have a Okotoks expert roofing technician from Daza Roofing to give you a cost analysis of total damages. However, what are symptoms to look for when it’s time for a new roof? Depending on its material, a roof can last anywhere from 15 to 40 years (and even up to 100 years for slate roofs). However, having a relatively “young” home doesn’t mean you won’t need to consider symptoms to look for when it’s time for a new roof. And if you’re wondering just how you’ll know when you need a new roof, then you’ve found this article just in the nick of time. So grab a cup of coffee, sit back and relax – you’re about to learn the surefire symptoms that practically guarantee it’s time for a new roof. Your Roof is Buckling – If certain parts of your roof’s shingles look like folded up bits of paper, then it’s bad news: your roof is buckling. Buckling typically occurs when a roof has been improperly installed, or just due to the ravages of time, as with older roofs. Unfortunately, a simple repair won’t fix this major problem, so be sure to call in the roofing experts for a fair quote. Your Roof Is Rotting – Many homeowners mistake algae for rot; however, one problem is innocuous enough and doesn’t call for major repairs, while the other is cause for a new roof altogether. Roof algae is more common in Southern states (that algae loves its warm and humid climates) and can be fixed by replacing the shingles. However, rot occurs when the roof mat absorbs the air’s moisture, causing the shingles to disintegrate and the roof itself to become weak and unstable. In this case, it’s best to have an expert help you identify what’s plaguing your home, as an improper diagnosis could cost you thousands of dollars. Your Roof Has Leaks AND Is Blistering – Blistering which occurs when there is moisture trapped in the shingle – is a sure sign of an improperly ventilated roof. If you’re also contending with ceiling leaks, then a simple roof repair won’t cut it. Again, call in the experts to see what they can do; chances are that they’ll recommend a new roof altogether. In these cases, getting a new roof for your Okotoks home can save you and your family thousands of dollars in useless and frustrating repairs. See if your home insurance covers your needs, or get a free quote from our professional Okotoks roofers.